orange | Am I There Yet? As I rifled through my PRIMPED VIP package I spied the iconic thick, tapered black lid of an O.P.I nail polish. YES! I do love these polishes, not only for the amazing every-colour-under-the-sun colour range, but for the quality formula of the polish, which for me, always performs well. ‘Chop-sticking To My Story’ was no exception. I would describe this colour as a ‘burnt-orange’. Definitely orange, but with darker undertones which take away the ‘bright!’ you expect with an orange shade. While not a colour I would usually pick for myself, I definitely found this a wearable and different addition to my nail polish wardrobe. I would suggest that this shade would suit girls who already have a (natural or fake) warmth/olive tone to their skin best. Look how shiny! And no top-coat! The eagle-eyed will notice my rush job. Sorry. Have to dash off to pick Maddy up from school. Apparently kids don’t like being the only ones left at the gate. I wouldn’t know… repression works well like that! The new pro-wide brush splayed out over nearly my entire nail bed, which made application speedy and easy. I loved the formula, which was thick but spread like butter on hot toast. Only one coat was needed, as this baby packed a pigment punch. When I first gave it the ‘official’ trial run, I applied two coats and a clear top-coat, which I reapplied during the week. 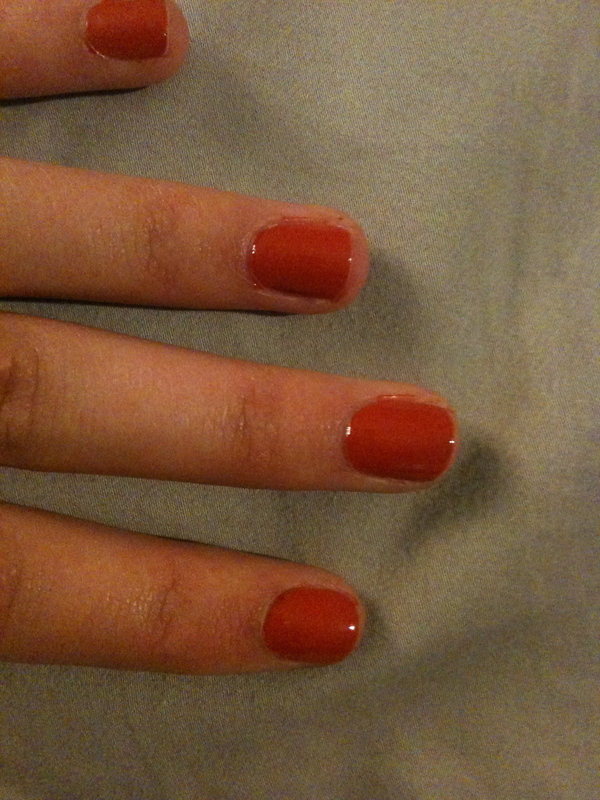 Super-glossy, strong nails that lasted about 8 days with only the slightest chip. Points, O.P.I, points! Hrmm. The picture above looks a little too bright. Here’s one that I believe shows the colour a little more true-to-life. The polish dries relatively quickly (no ‘dries in .32 milliseconds’ marketing gimmicks here) for a thick formula, which is handy for us gals who like to knock our freshly painted digits on anything and everything after painting. O.P.I, you and your rainbow of colours are definitely alright in my books, and I look forward to adding to my (sadly small) collection.